Choose from a variety of spacious rooms at this San Juan resort with high-speed Internet access and a balcony with a garden or ocean view. The traditional or contemporary room is decorated in cool, calm tones and furnished with a desk and ergonomic chair. 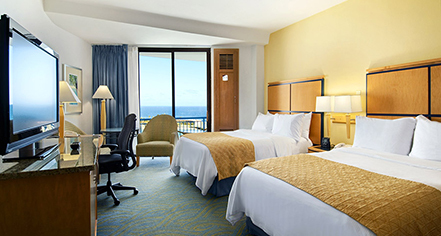 Enjoy stunning Atlantic views anytime of the day in these Ocean View Guestrooms at Caribe Hilton. Furnished with one king-size or two double beds, these spacious San Juan accommodations are thoughtfully-appointed with a private balcony and work area with desk and chair. Some guestrooms are also equipped with beautifully-adorned marble baths with a walk-in shower. 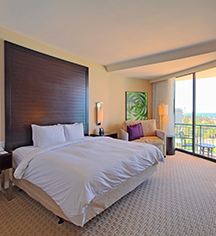 Guests will experience their own paradise with beautiful views of San Juan in a Guestroom with Balcony at Caribe Hilton. Available with one king-size or two double beds, these stunning Puerto Rico accommodations are furnished with high speed Internet access, work area with desk and easy chair, and Peter Thomas Roth bath products.